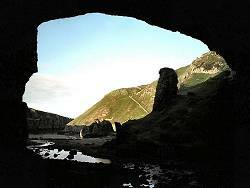 Image: the entrance of Smoo Cave. © Copyright 1994-2002 by Martin Junius. With kind permission. Location: Durness, North Scottish Highland Region. 2km East of Durness on A838 to Lerinmore, at the head of a sea inlet. Bibliography: Pollard, Tony (1992): Smoo Cave, 20 pp maps, figs. 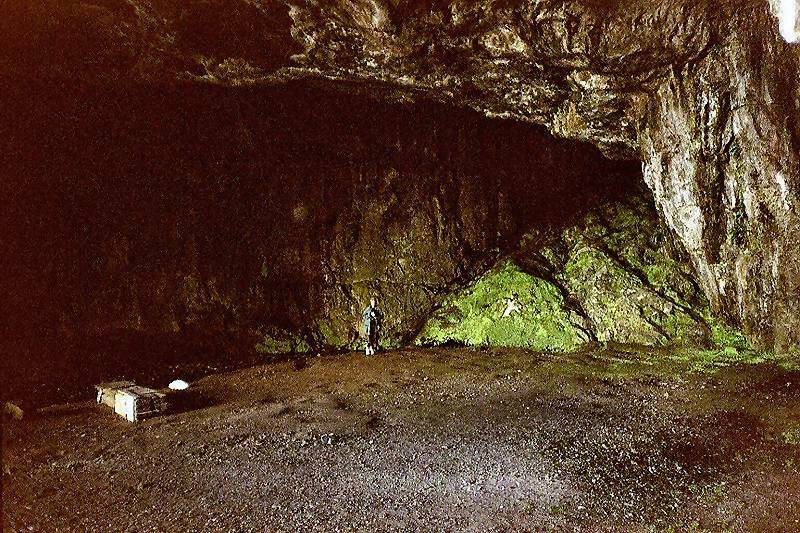 Archaeological excavation of Smoo Cave, Sutherland for Caithness and Sutherland Enterprise carried out by Glasgow University Archaeological Research Division. The cutting back and recording of an eroding shell midden section in Smoo Cave, Sutherland, resulted in the identification of several occupation / activity horizons. The shell midden, the earliest phases of what appeared to be Iron Age, represented the latest phase of Iron activity. The earlier deposits, which are substantially lower than the cave floor, may represent Mesolithic activity within the cave. The investigation also brought to light a further midden deposit located in a former cave some 50 m to the NW of Smoo Cave. 19-AUG-1814 visited by Sir Walter Scott. 1904 first organised excavation took place but a report was never published. 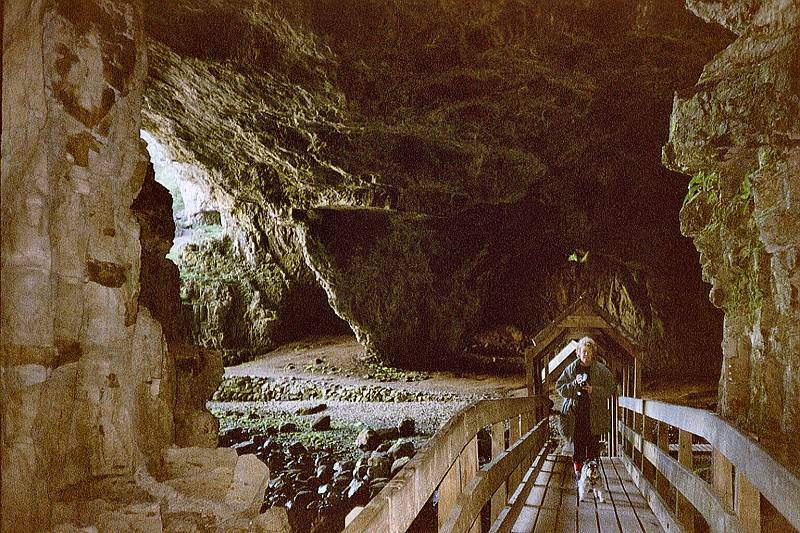 1986 cave was modernised, the footpaths improved and light installed. 1992 archaeological excavation in the cave. 2002 visited by Tony Oldham. Image: the Allt Smoo enters the cave. Smoo Cave is Scotlands only show cave. It is a very large sea cave, but the rear part is a karst cave which formed inside limestones of the Durness Group. The Durness Group are layers of limestones and dolomites. The rocks were formed during Odovician and Lower Cambrian as shelf sediments. They are found in a narrow belt running north to south, from the area of the Smoo Cave to Ardarroch at Loch Kishorn. There is even a short belt of limestone in the same direction crossing the island of Skye near Broadford. The eastern border of this band is the Moine thrust, a famous and important system of thrusting and low grade metamorphism. The limestone belt is typically one or two kilometers wide. The narrow band of limestone is of great economic value, in an area where limestone is rather rare. Most quarries can be found near Ullapool and at Torrin, in Skye. And the whole belt is karstified, with numerous caves. The most important part of the belt is the Assynt area, about 40km south of Smoo cave, where the belt widens and is nearly 10km wide. 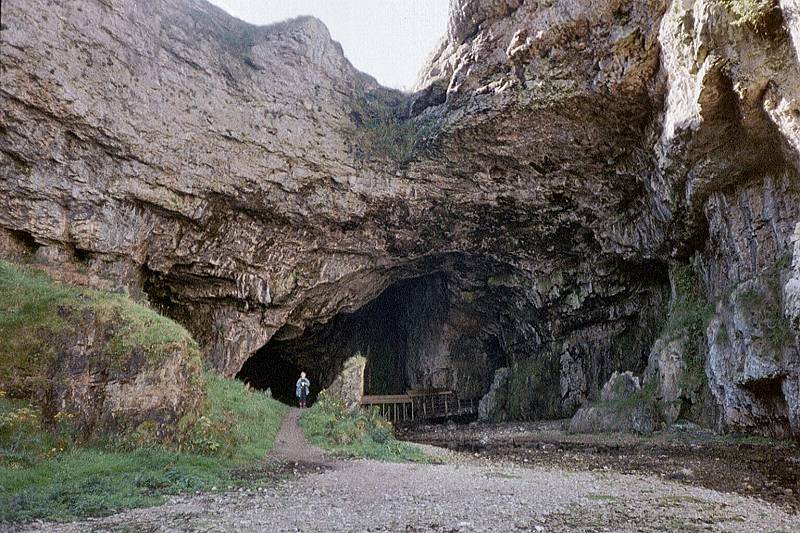 The karst features of Smoo cave are typical for such a small limestone area with impermeable and insoluble rocks surrounding it. Brooks flowing on impermeable rock, disappear in swallow holes as soon as they reach the border to the limestone. 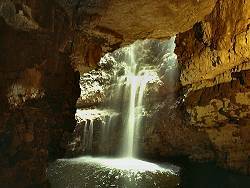 Now they drain underground and reappear in karst springs and caves. Such a cave river is to be found inside Smoo cave, water from a brook which disappeared only a few meters away. Smoo Cave, text from: Tony and Anne Oldham (1972): Discovering Caves - A guide to the Show Caves of Britain. 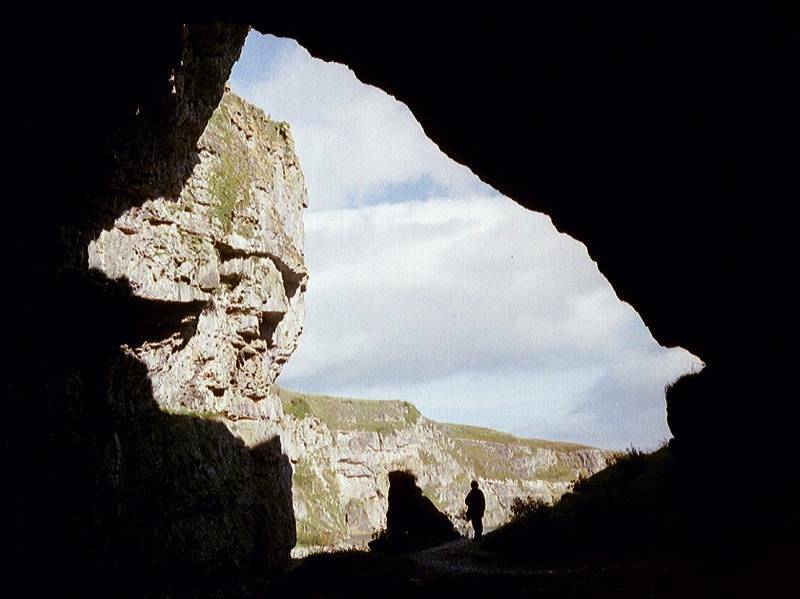 Smoo Cave by Tony Oldham (2002). Extensive description with a survey. Memoirs of the Life of Sir Walter Scott by J. G. Lockhart (2002). Extensive description with a survey. Search Google for "Smoo Cave"